Lynn Connett graduated with a bachelor's degree from California State University in 1986, and entered Air Force Officer Training School on January 5, 1987, receiving her commission as a 2d Lt on March 31, 1987. After completing the Administrative Officers Course at Keesler AFB, Mississippi, Lt Connett served as a Squadron Section Commander with the 2152nd Communications Squadron at Grand Forks AFB, North Dakota, from May 1987 to February 1991, followed by service as Executive Officer for the 319th Support Group at Grand Forks AFB from March 1991 to July 1992. She next completed Squadron Officer School at Maxwell AFB, Alabama, and then served on the staff of Headquarters Air Force Office of Special Investigations at Bolling AFB, Washington, D.C., from October 1992 to February 1996. Maj Connett served as Chief of Air Force Personnel Issues with the Air Force Element of the Defense Intelligence Agency at Bolling AFB from March 1996 to July 1999, and then attended Air Command and Staff College at Maxwell AFB from August 1999 to June 2000. He next assignment was as Special Actions Officer with Headquarters Air Education and Training Command at Randolph AFB, Texas, from July 2000 to June 2002, followed by service as the Commander of the 81st Mission Support Squadron at Keesler AFB from July 2002 to July 2004. Col Connett served as Chief of Support Officer Assignments and then Chief of the Commander's Action Group with the Air Force Personnel Center at Randolph AFB from July 2004 to July 2006, before attending the National War College at Fort Lesley J. McNair, Washington, D.C., from August 2006 to June 2007. Her next assignment was as Chief of the Air Force Learning Division with the Directorate of Force Development at Headquarters U.S. Air Force in the Pentagon from June 2007 to June 2008. Col Connett served as Commander of the 81st Training Group at Keesler AFB from June 2008 to July 2011, and then as Deputy Director of Plans and Integration with Headquarters U.S. Air Force in the Pentagon from August 2011 until her retirement from the Air Force on March 1, 2012. 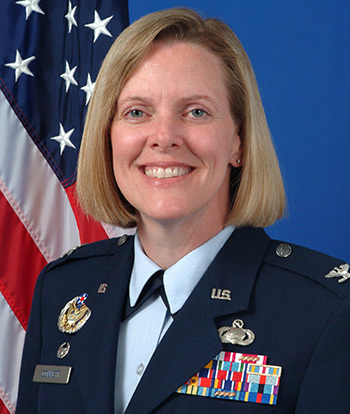 Colonel Lynn F. Connett distinguished herself by exceptionally meritorious conduct in the performance of outstanding service to the United States as Commander, 81st Training Group, 81st Training Wing, Keesler Air Force Base, Mississippi, from 21 June 2009 to 28 July 2011. During this period, Colonel Connett led the Air Force's second-largest technical training group graduating over 22,000 Airmen, Soldiers, Sailors and Marines, including 302 international students representing 41 countries, from 300 technical training courses, awarding initial qualification in 38 career fields. Colonel Connett led a 25 million dollar implementation of Cyberspace training, which encompassed standing down 14 legacy communications courses while initiating 19 cyberspace courses, better posturing the force to meet the operational demands of a dynamic network-centric environment. Additionally, her group tested and validated the new technical training transition program for non-prior service Airmen, which is now the standard for 36 squadrons and more than 30,000 Airmen across the Air Force. Strategically minded, she enhanced operations by restructuring the group to close leadership gaps, acquiring over seven million dollars in end-of-year funding for facility modernization and reducing policy guidance by 60 percent to eliminate unnecessary and outdated documents. During the 2010 Headquarters Air Education and Training Command Unit Compliance Inspection, over 70 percent of the areas rated exceeded standards, setting the stage for group and wing overall "Excellent" ratings. Finally, Colonel Connett led her 1,300 personnel to numerous accolades, highlighted by the 2009 Air Education and Training Command Innovation Award and the 2010 General William R. Looney III Training Squadron of the Year Award. The superior initiative, outstanding leadership, and personal endeavor displayed by Colonel Connett reflect great credit upon herself and the United States Air Force.